If you are looking for the best inflatable water slides then you are in the right place! I have poured over the mounds of information online about the different inflatable water slide options out there and have come up with everything you need to know when buying the best inflatable water slide for your backyard! Most of these are essentially a bounce house turned into water park and they are sometimes known as an inflatable water park. 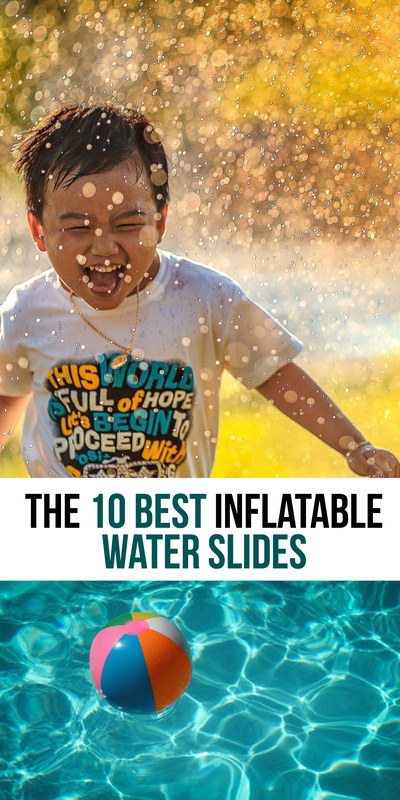 I use both terms, inflatable water slide and inflatable water park interchangeably in this guide! If your summer memories are like mine, they involve sunshine, laughter and getting outside! One of the best memories I have is the freedom to play with my friends in my backyards. Whether we were making up games, riding our bikes, screaming and laughing, I have so many summer memories outside. Times are changing and with all of the new toys on the market and entertaining video games that are drawing kids to being in front of the television or a tablet or phone, parents, just like me, are looking for creative ways to keep their kids outside, and happy. I am just like you, and my kids are pulled into the video games and playing inside and I found the best inflatable water slide was a way to get them outside and playing! If you are anything like me and want to weigh all of your options on the best kids inflatable water slide, check out the comparison table below and then have a read of each of the descriptions to decide which kids water slide works for you! Below you will find the best inflatable water slides on the market. If you are like me, there are several reasons why you are looking for the best inflatable water slide for your kids. It can help get your kids outside, encourage exercise, keep the kids cool in the summer, and its portability has many advantages. As I mentioned above, there are several benefits to having a backyard waterslide. It encourages summer fun outdoors and draws the kids out of the house. It is a great way to cool off on those hot summer days. It is much more convenient than renting something for the kids to play with. The portability of an inflatable water slide is also one of the benefits. These inflatables are cheaper than a standing structure. They can also be put away when not in use if backyard aesthetics are essential. These inflatable water slides can be rolled away into storage bags in the winter months and they will not be subject to harsh weather like permanent play structures are. When you read the reviews below, keep these things in mind to help you choose the best inflatable water slide for your backyard. >> Click here to check prices and read more reviews. The Banzai inflatable water slide is one of the giant inflatable water slides for sale. At over 10 feet tall, it’s height makes it one of the taller ones on the market. But take that with a grain of salt, as it does not mean that the slide is any larger than other brands because of its roof! It features a climbing wall and slide and also has a tunnel to play in. The Banzai water slides for sale are not a cheap water park, but its size and quality are a worthwhile investment if it suits your family’s needs. If it is not quite warm enough for cold hose water, you can always set this up and have your little ones use it without water. It may be a bit big for toddlers, but they can for sure master the climbing wall with adult supervision. Well known brand in the inflatable bounce house world. To get a better idea of the size of this huge inflatable water slide, check out this youtube video that shows toddlers and adults using the water slide! >> Click here to read reviews and check prices! The Blast Zone Hydro Rush Inflatable Water Park has a large playing surface and is recommended for kids aged 3 and up. It prides itself on safety and durability and features a 10 foot long slide with overhead sprayers. Its design is meant to keep kids inside the splash area, which keeps grass from building up in the pool. This deisgn feature shows that Blast Zone knows what it is doing when it comes to making the best inflatable water bounce house structure! 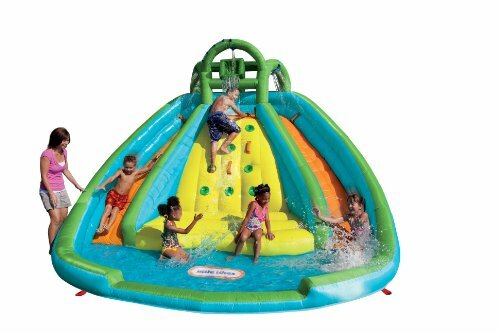 The Banzai Pipeline Twist Kids Inflatable Outdoor Water Park Pool is one of the largest inflatable water slides for sale on the market! While more expensive than the ones listed above, with the higher price point comes a larger playing surface and more features! This outdoor inflatable water slide has two slides, a tunnel and two water cannons. Something to keep in mind with these inflatable water parks is that the larger they are, the heavier they are and you will need two adults to carry and position it. 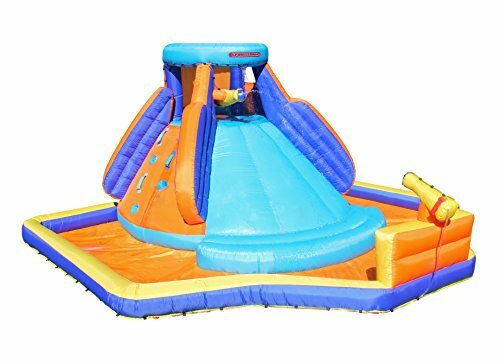 The Sportspower Battle Ridge Inflatable Water Slide features a single super-wide slide, a climbing wall and water cannons. It supports 250 lbs on the structure and is designed for up to 5 children, aged 3 to 8 years old. 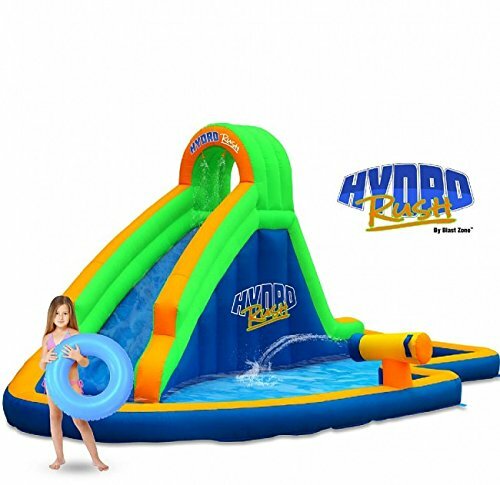 If you are looking for the best inflatable water slide for the toddler age group, this is a good option that they can grow into! Comes with anchors and repair kit, as well as the blower and storage bag. 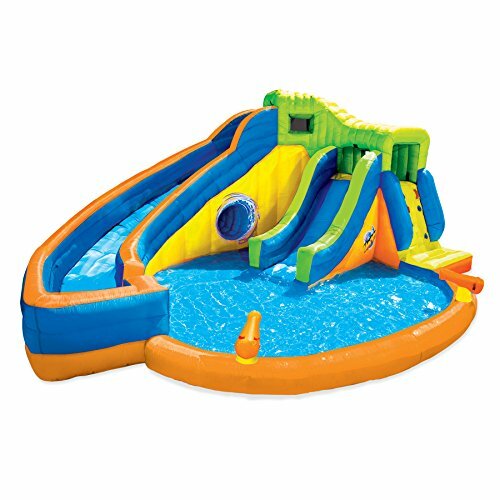 The Kahuna Twin Peaks Kids Inflatable Splash Pool is another one of the large inflatable water slides that also comes with a big price tag. But if you want to go big, then the Kahuna twin peaks bounce house water slide is a good choice. With two slides, children can race up the climbing wall and race to the bottom of the pool on one of the two slides. 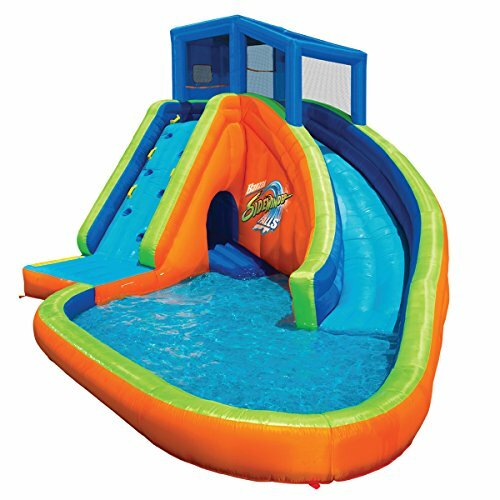 This inflatable water slide is more of an inflatable water park as it also features two basketball hoops which gives the kids more ideas for creative play. I included the Intex Surf ’N Slide Inflatable Play Slide for small spaces and those looking for a slip and slide, not a bounce house water slide. While the instructions say for ages 6+ I am certain that younger children will also have fun on this blow up slide and that children that are much older than 6 will not be able to use it very easily. Consider an electric pump if you choose to purchase this as a foot pump will take a while to inflate. 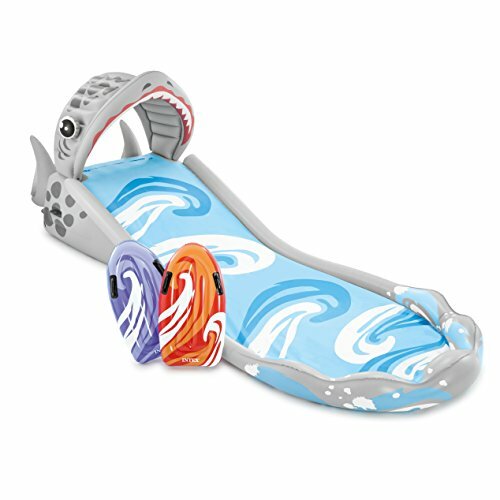 The HearthSong Inflatable Water Slide is another cheap inflatable water slide to get those kids out of the house on hot summer days! It has a 12 foot long slide and the manufacturer reccomends it for ages 4 to 15 although I would think that an older child would not be amused for long. This is another good option if you do not have hundreds of dollars to spend on a backyard toy but want something for the summer. 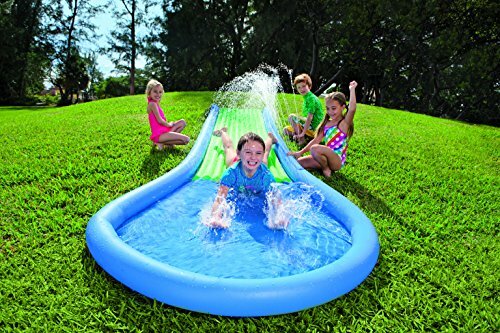 The Hearthsong Inflatable Water Slide is actually more like a traditional slip and slide and does not have an elevated slide. As I mentioned above, there are a few factors to consider when you are looking for the best inflatable water slide for your kids! Once you have a budget in mind and have seen the sizes of the inflatable water slides for sale, you will probably have a good idea of what you want. Here are a few other things that you should consider when you purchase. Firstly, you need to have a level grassy surface to put the inflatable water slide on, or the splash pool portion will not fill up properly. Secondly, you need to have water running to use most of the features. If you have water restrictions where you live, I suggest you turn it on and fill the pool and then use a bucket to keep the slide area wet. Thirdly, you need power as all of these inflatable water slides have a constant blower that keeps them inflated. Make sure you have an extension cord to attach the blower cord to if it is not going to be set up close to the house. Fourthly, these are all large play structures and are heavy. Every one that I have recommended weighs 50 lbs. Ensure you carry it correctly or with help so you do not end up injured! No one wants that in the summer time! Next, do not leave it wet or try to put it away wet. If the structure is still wet and you roll it up, you will end up with mildew spots before long. Once drained, blow it up again to get the excess water off and shake off as much as you can. On a hot day, it should dry to be put away. Check manufacturer’s suggestions for leaving it set up for multiple days. One of the downfalls of this is that your grass will take a beating from the weight, the water and the lack of sunlight! Lastly, cheap inflatable water slides for sale are cheap for a reason. If a deal seems too good to be true, it probably is. Each one of these large inflatable water slides have plenty of Amazon reviews from verified purchasers, to help you make your purchase. If you are looking to make your backyard kid-friendly and want to ensure they spend as much time outside as possible, also consider the best trampoline for kids which can be fun in all seasons depending where you live!